From now until February 14th, I'm more than happy to be the Artist in Residence at Providence's multifaceted AS220. 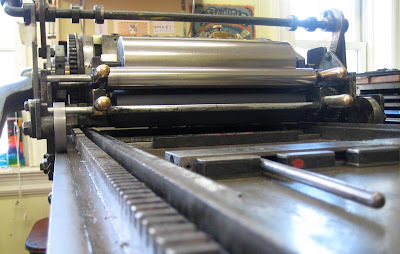 I'll be working exclusively in their letterpress print shop, taking a slight departure from my usual practice and focusing on getting some small prints out of my head and onto paper with the help of their Vandercook No.4 press. I hauled three bags, overladen with reams of new paper, through Amtrak trains and stations all day Monday with the generous help of Providence writer Walker Mettling, himself returning from a month-long residency at Pittsburgh's Cyberpunk Apocalypse. Besides printing and more printing, I'll be doing a presentation on Wednesday the 10th, at 6pm in the AS220 performance space. "I Brake for Historical Markers" will be a slideshow and discussion of progressive and alternative historical markers and plaques. Bec Young will take over the residency for the second half of February when I return to Pittsburgh. Special thanks to Justseeds cohort Meredith Stern for making this happen for both of us!